Modelling of electromagnetic waves interactions with the human body -M.-F. Wong, J. Wiart. A geometrical optics and uniform theory of diffraction based ray tracing optimisation by a genetic algorithm -R. Matschek. Fast algorithms for layered media -W. Ch. Chew, B. Hu, Y.-C. Pan, L.-J. Jiang. Shared issues of wavefield inversion and illustrations in 3-D diffusive electromagnetics -D. Lesselier, M. Lambert, G. Perrusson. State of the art computional methods for the prediction of radar cross sections and antenna-platform interactions -F. Molinet, H. Stève, J.-P. Adam. Inverse characterization of antennas by equivalent sources using spherical harmonics -A. Gati, Y. Adane, M.-F. Wong, J. Wiart, V. Fouad-Hanna. Some numerical models to compute the electromagnetic antenna-structure interactions. -N. Zerbib, M'B. Fares, Th. Koleck, F. Millot. 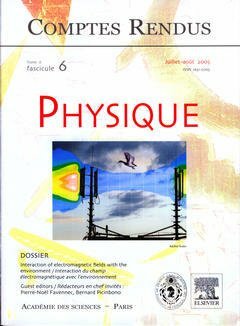 Electromagnetic computation of multilayer dielectric objects using Gaussian beam based techniques -A. Chabory, J. Sokoloff, S. Bolioli, P.- F. Combes. Diffuse reflection by rough surfaces: an introduction -Michel Sylvain. Sea surface probing with L-band Doppler radar: experiment and theory -M. Saillard, Ph. Forget, G. Soriano, M. Joelson, P. Broche, Ph. Currier. Left handed propagation media via photonic crystal and metamaterials -T. Decoopman, T. Crepin, M. Perrin, S. Fasquel, A. Marteau, X. Mélique, E. Lheurette, O. Vanbésien, D. Lippens. Metamaterials: from microwaves to the visible region -D. Maystre, S. Enoch, B. Gralak, G. Tayeb.